When I went out looking for a fall cocktail I wasn’t really expecting to become interested in psychology. But you don’t always know what it is you’re actually investigating when you start a case. And that is what happened. I went looking for fall flavor and I found it. I found four spectacularly delicious warming things to toast the change of seasons with and four damn patient bartenders. Which I appreciated because, as always, I had a lot of questions. 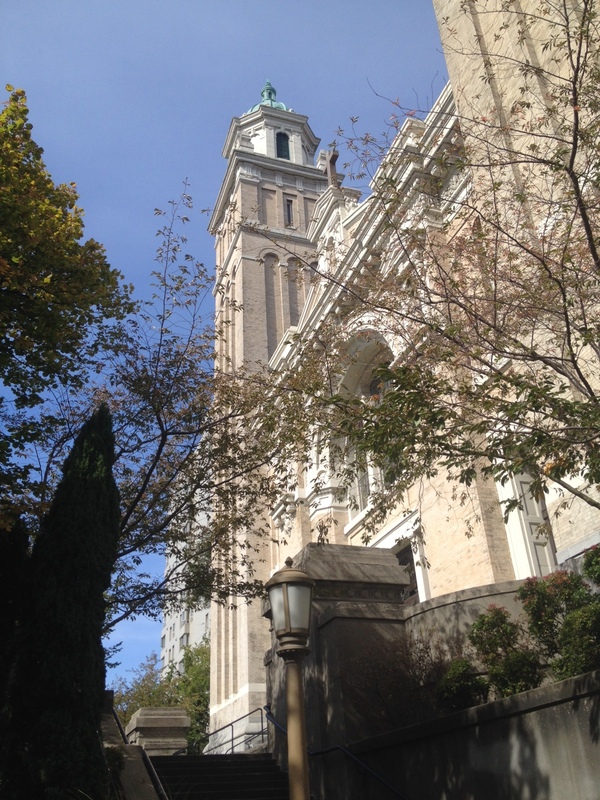 Last August I was sitting outside of a coffee shop on first hill, writing, when I heard a bell begin to toll noon. It was a beautiful sound, coming through the quiet moments in my music. I’d never heard a bell tower there before, not as far as I knew. Sitting there in hot sunshine with iced coffee and listening to the bell mark the time I felt like I was traveling. I felt far away from work and worry. But time ticked on and I had to leave. And I didn’t hear the bell again, not until a full year later. A few weeks ago I heard the bell again. I was sitting outside the same coffee shop (we’ll call it a ritual not a rut, shall we?) when I heard it once again. I’m convinced I had not heard it once between those two times. It seemed like a strange coincidence, that the only two times I’d heard it had both been in the end of August. I started to wonder why. Did it only ring in summer? Or very infrequently? So, of course, I decided to look into it. The next time I walked up to that coffee shop I asked the two baristas. I know both of them by now although saying I “know” them is maybe stretching the relationship. After a year they have sort of recognized that I come there a lot but we’ve never had much of a conversation. I asked if they had heard the bells. The guy said yes, sometimes, but that it was hard to say because he didn’t really notice most of the time. I asked where the sound was coming from and the girl said she thought it was from the Church just around the corner, the Lutheran church. The guy said it sounded like it came from that direction and pointed vaguely in what I believe was a south-eastern direction. I walked up the hill and found myself self at the base of an impressive Catholic cathedral. Peering up I saw what appeared to be a bell-tower at the peak. that’s a bell tower, right? As an investigator my insatiable curiosity is something of a professional asset. The rest of the time it can be frustrating. Have you noticed how many little mysteries present themselves in the course of a day, especially living in the city? For example, why does that one car have approximately ten thousand toys glued on it? What led to that decision and then the impressively painstaking followthrough? We may never know. But that kills me. I want to know why. I was walking in Pioneer Square, on my way back to work from my habitual coffee-lunch spot. I passed this giant, gorgeous mural on a building I’d never noticed before. 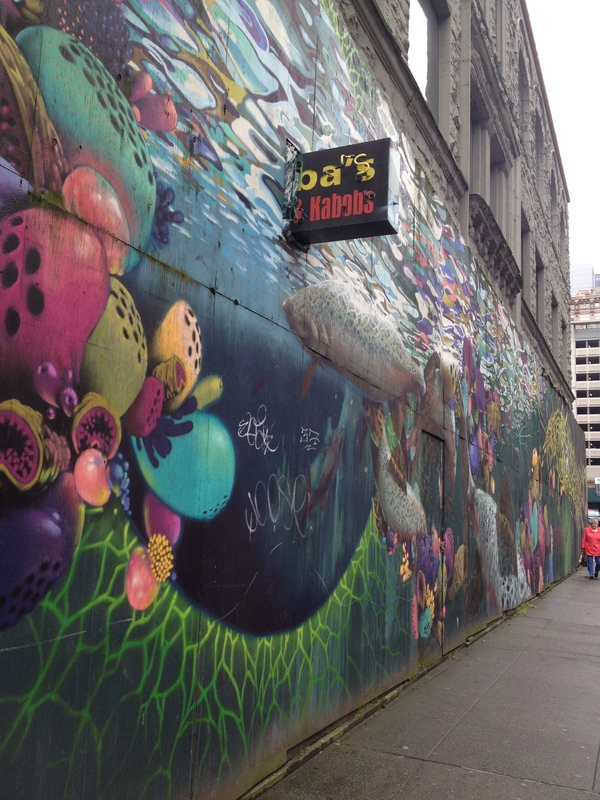 It’s this bright, graffiti-style underwater scene, but there’s a sign sticking right out of the middle of it. For Kabobs. But you can’t read the whole thing because only half of it protrudes beyond the plywood.